We’ve all seen Dr. Bronner’s 18-In-1 Hemp Pure-Castile Soap. Nearly every square inch of its iconic label is covered in a rambling treatise written by a religious zealot in size six font using 1,000 more words (albeit kind words), hyphens, and exclamation points than is necessary. But look past that, and you’ll see it’s what’s in the bottle that matters: a soap for the people. As advertised, it delivers as a truly natural all-in-one soap, for both your body and your household items. Gone are the days of a cabinet dedicated to single-use cleaners. There is this modern inclination that, in order to properly clean ourselves and homes, we need a purpose-designed soap for everything; a hand soap, body wash, face cleanser, shampoo, conditioner, laundry detergent, dish soap, dish detergent, floor cleaner, window cleaner, carpet cleaner, kitchen cleaner, bathroom cleaner, toilet cleaner...even yoga mat cleaner. And while targeted cleaning products can achieve terrific results when used correctly, a universal, natural soap like Dr. Bronner’s can probably get the job done on its own more often than not. Dr. Bronner’s began as my go-to body wash, and if you only end up using it as such, it’ll still be a worthwhile purchase. That first lather with their Peppermint scented soap (peppermint is key) over your skin will change you. For a moment you’ll feel nothing, a body wash like any other. But then that cool kiss of natural mint will hit. You might first notice the tingle in a single spot, but with a gentle lather, it’ll wash over your whole body, tickling your taint, and giving you a kick to start the day. You’ll be hooked. Don’t worry, you won’t have to chase the peppermint dragon, you’ll enjoy those few seconds of blissful awakening every wash. Hungover? You’ll still get that peppermint kiss of hope. Dr. Bronner is all love. But then it became more than that for me. It soon found its way into my hair, if my body loves it, why not my scalp? And as I’d run out of one cleaning supply in the house, Dr Bronner’s was there to fill the void left by a product I was unwilling to replace. I used it to bathe my dog. Then I found myself using it to clean floors, countertops, and windows. I scrubbed some pans with it and refilled some empty hand soap bottles. As someone who was already lazy and cheap about getting the “right” cleaning supplies, this was a a godsend (no pun intended). The dog was soft and happy, household surfaces shined anew, pots were grime free, and hands were smooth and fresh. Dr. Bronner’s is now my default for a handful of cleaning needs, and a trusted fail safe when another bottle runs dry. Dr. Bronner’s hasn’t replaced all my cleaning supplies, but it’s definitely reduced the excess. And since it’s all natural, I don’t have to think twice about using it, it’s basically always safe. Just remember to Dilute! Dilute! Ok! Note: Have you seen the Dr. Bronner’s documentary? Is it worth watching? Bonus points if you can tell me where to stream it, everywhere that claims to have it does not. 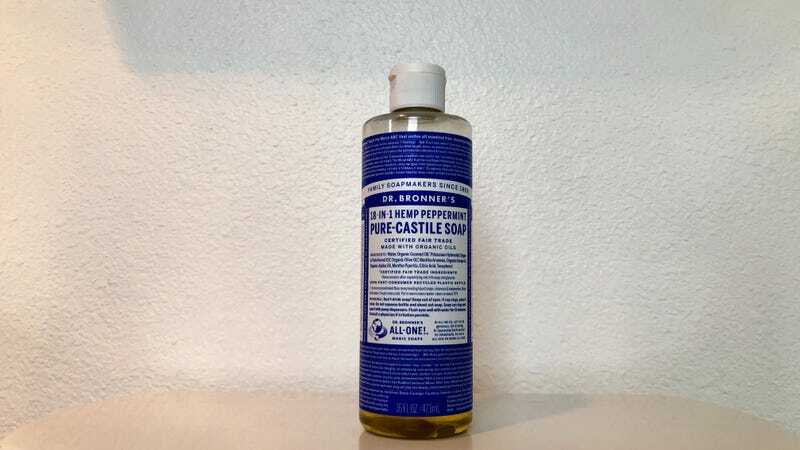 Dr. Bronner&apos;s Pure-Castile Liquid Soap - Peppermint 32oz.